There are so many different types of essential oils out there on the shelves. I wanted to find the best one for my family. 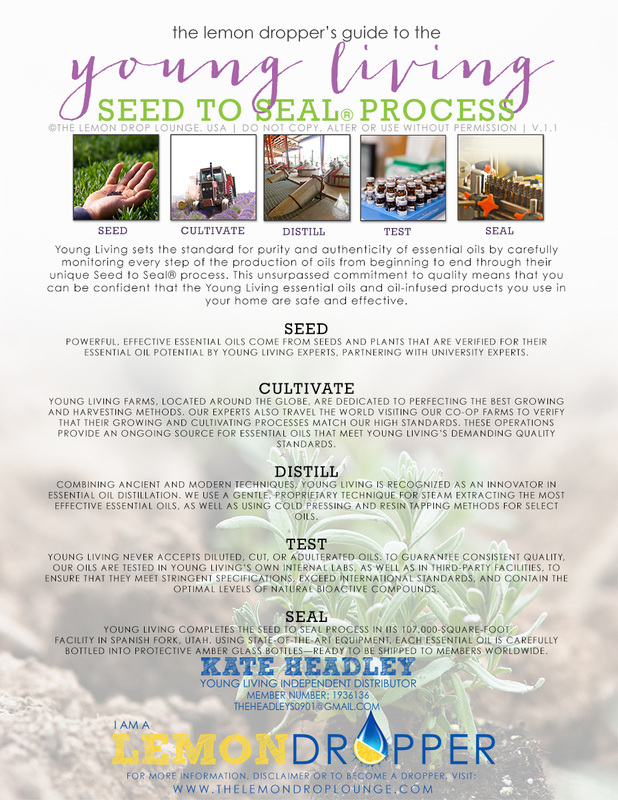 After doing my research on essential oils and how they are processed, Young Living was the ONLY company who had the "Seed to Seal" promise. In their own words, "This is not a slogan -- it's our calling." You've seen them out there on grocery shelves and at health food stores. You can get an "essential oil" anywhere. They may be labeled "Pure," "Organic," "100% All natural," etc. That's what sold me on my first purchase. It was an "organic" bottle of tea tree oil that was rebottled by the store and had no instructions. I learned, after I purchased that first bottle, that the FDA only requires essential oils to contain 5% of actual essential oil to be labeled as "100% Pure Essential Oil." Hmm...so then the other 95% is...?? So yes, that bottle $5 or $10 bottle of oil has been mass produced with very little attention to HOW it is processed. Did you know that HOW the oil is processed makes a HUGE difference? Young Living, especially Dr. Gary Young, is very particular about their farms, distilleries, and the process and production of their oils. Did you know that the TIME OF DAY a plant is harvested and processed can result in a batch gone wrong? I wouldn't want that oil being used on my largest organ; my skin! So please, don't take a chance with a cheap bottle of oil. You want your bottle to be filled with 100% essential oil. Not 5% to maybe 10% of oil and the rest made up of fillers, synthetics, water, and/or perfumes. Please do your own research to see if Young Living is right for you and your family. I was happy with what I found.